For the 4th consecutive year we’ve seen a DRY Memorial Day Weekend. Hard to believe! But it fits the weather regime we’ve seen for the past 6 weeks…Unusually dry and warm. We’ve seen a week or two of unusually warm and dry weather in springtime, but this is getting strange. Folks, we’re living through an unprecedented period of warm and dry weather…one that hasn’t been seen this time of year for at least 80 years, or much longer. If we add in the next 3 days from our 7 Day forecast, it becomes a tie for #1 with 1992. Even stranger is the lack of rain. The past 6 weeks we’ve seen no soaking rain! The .34″ we’ve seen in the entire 2nd half of meteorological spring (ends Thursday) is less than half of the previous dry record! I’ve lived west of the Cascades all except maybe 2 years of my life. Never have I seen it so dry in late May. My yard/garden/gravel driveway looks just like July…dry and dusty. In past years when we do get a dry spell in May, we always see a soaking on the maps/models within the next 7-10 days. Why has it been so dry and warm? It doesn’t look all that impressive on a weather map, but here’s the 500 millibar height anomaly for the past month. The cool colors are lower than average heights (generally colder than average). The opposite end of the spectrum are the yellow/orange areas. You see over SW Canada and NW USA heights have been well above average. Now it’s typical for upper-level heights to gradually rise from April through August. 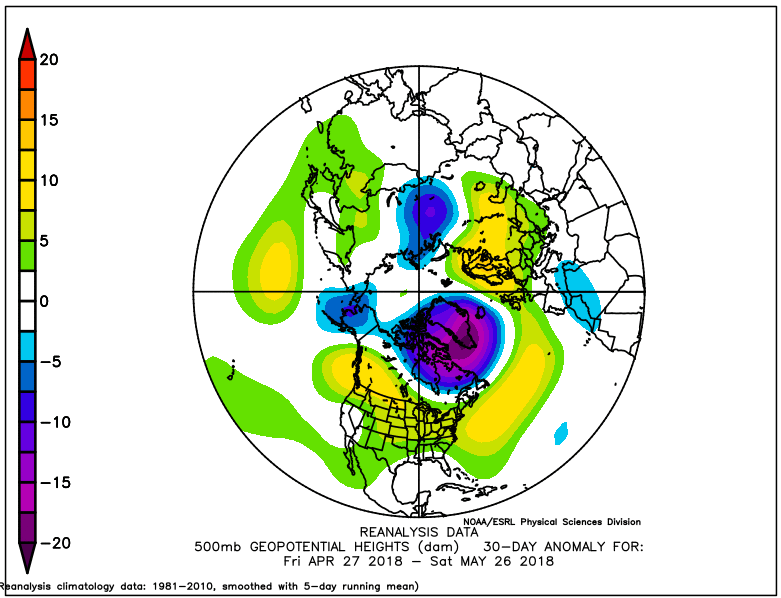 But the net effect of that positive anomaly is to push our season “forward” a month or so with heights more like what we would typically see in June or early July. And in early summer those higher heights typically push weather systems farther north and dry/warm us out/up. Do we see a soaking ahead? Likely not a soaking, but there does appear to be an increased chance for a least some dust-settling showers about a week from now. Check out the ECMWF ensemble 24-hour rain forecast. Note that any colored horizontal bar says at least .10″ in a 24 hour period. You don’t see many of those bars do you? 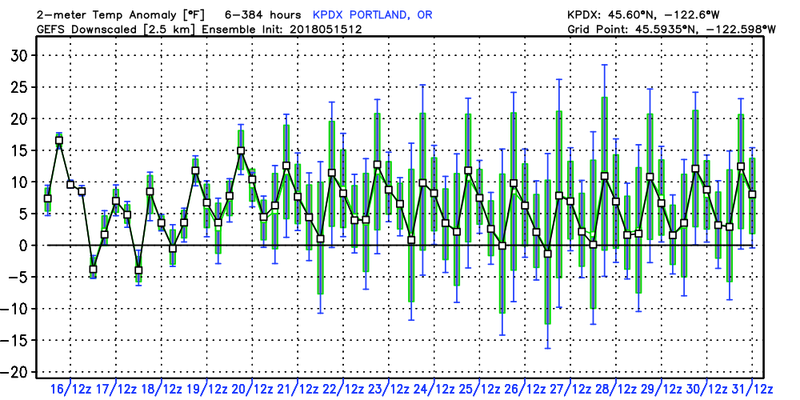 The best chance for showers seems to be right around the 3rd-5th (Sunday-Tuesday), but even that is only appearing on maybe 1/2 of the ensembles. Temperatures WILL be cooler this next week as weak upper-level troughing hangs nearby. Maybe most noticeable will be cooler temperatures at night due to the dry airmass arriving tonight. At least that drier/cool airmass helps to break up the marine low clouds so we’ll see plenty of sun the rest of the week…mixed with clouds. A pleasant end to a crazy warm/dry May! Memorial Day Weekend: Looking Nice! The general weather pattern for the next 4 days is pretty clear, so I’m pretty confident in our weekend forecast at this point. An upper-level system passes through Eastern Oregon tomorrow and early Saturday. This brings thunderstorms and even a soaking for spots, especially the far eastern part of the state. Saturday will be mainly cloudy, cool, and briefly drippy in the morning west of the Cascades. That’s because a very deep marine layer sits overhead most of the day. Sunday and Monday the marine layer thins westside and thunderstorm moisture disappears eastside. The result will be very nice summer-like weather for days #2 and #3 this weekend. Cascade camping forecast…temperatures are for lake elevations…around 3,500′ or so. I sure hope we have a soaking at some point in the next few weeks. 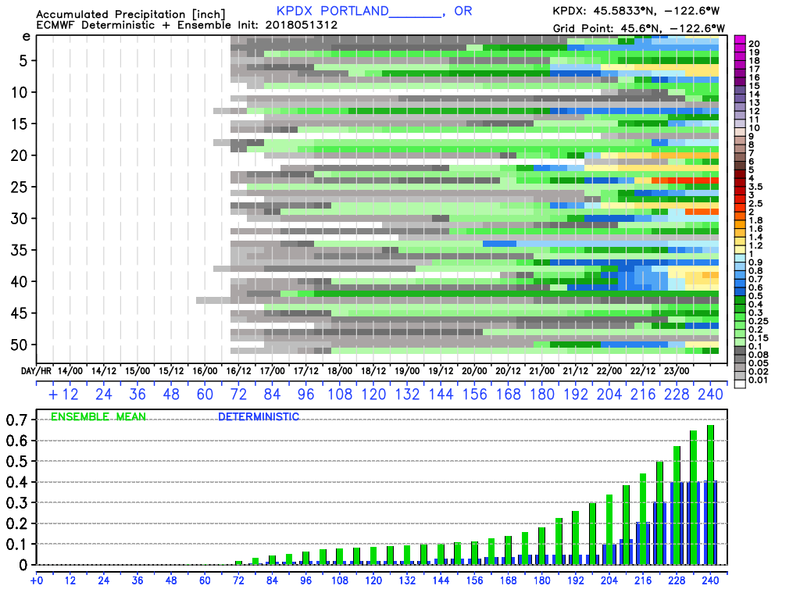 But for now models are not showing a soaking, at least in the next 7-10 days. We’ll be keeping a close eye on the radar tomorrow afternoon as strong thunderstorms develop eastside. SPC has the eastern third of the state in the MARGINAL RISK area for storms. Flooding rain, damaging hail, strong wind are the possibilities under some storms. Keep an eye on the sky over there! All of the USA minus Florida and coastal California has been very warm. 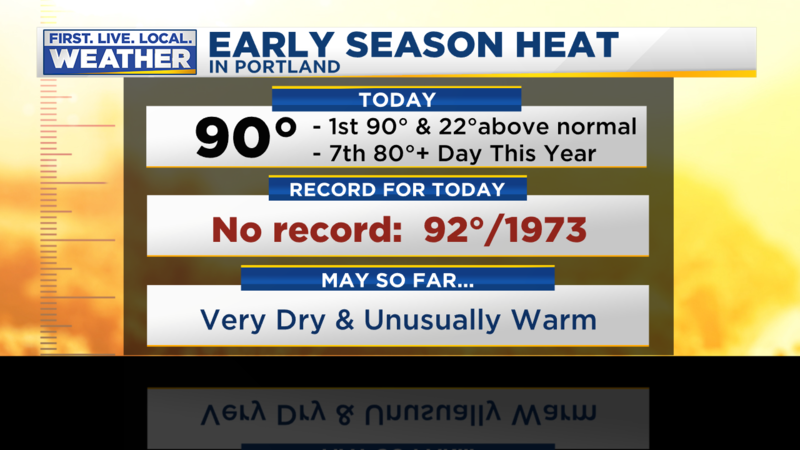 Here in western Oregon we’re are in the middle of one of the warmest Mays on record. I just planted most of my garden yesterday. Typically I’m fighting cold/wet conditions, slugs, and not even thinking about watering in mid-May. But we’ve seen only .25″ in the past 4 weeks. This is the driest April 21st-May 21st on record at PDX. We’ve never seen it this dry during this period of time in the past 80 years in Portland. 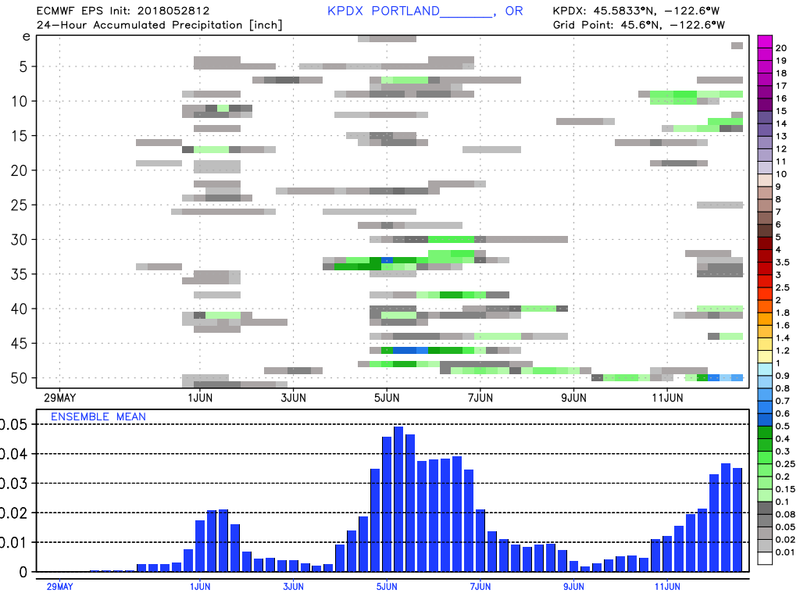 Looks like about 30 of 50 ensemble members give us at least some light rain early this coming weekend. Note how dry it is once again next week. This dry weather is great for outdoor activities of course, but obviously we need some sort of soaking in June or we’ll have water supply issues (dry wells) later in the summer. Maybe fire season problems too. One more benefit of the early warming is a rapid meltdown of the Cascade snowpack. Look at the past 10 years snow depth on this date on Mt. Hood. I remember 2009-2012 when campgrounds opened late up in the Cascades. But now 3 of the past 4 springs we’ve seen a low snowpack this time of year. The snow water equivalent at this elevation on Mt. Hood is only about 1/2″ of the median for this date. This Memorial Day weekend many mountain lakes are open for business…you might even beat the mosquitoes! Gene Blick took this pic at Olallie Lake (5,000′) just today…pretty much snow-free except for some drifts still blocking the last section of the road. They will be gone soon. Enjoy the warmest/sunniest day of the week Tuesday. Highs should reach into the lower 80s west of the Cascades. Kilauea Eruption: Should You Cancel a Hawaiian Vacation? You’ve probably heard that Kilauea on the Big Island of Hawaii had an explosive eruption just before sunrise today. You can always get the latest info from the Hawaiian Volcano Observatory. A column of smoke/ash rose well above 25,000 in the pre-dawn sky. 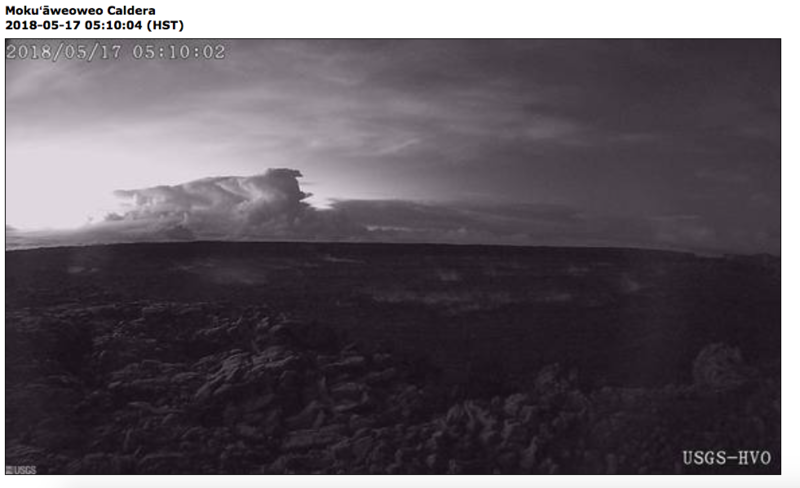 Here’s the view from a HVO camera on Mauna Loa, itself an active volcano. The eruption column is on the left side of the pic. This volcano doesn’t often see explosive events (unlike Pacific Northwest volcanoes). Typically eruptions consist of lava oozing or fountaining out of the ground plus volcanic gases. One question today: “could the ash reach us?”. That’s a good question with a simple answer. YES, ash COULD reach us, but it would have to be a much larger eruption AND wind flow would have to be just right for it to get here. So in reality, NO, it’s unlikely we will ever see ash from that volcano in the Pacific Northwest. 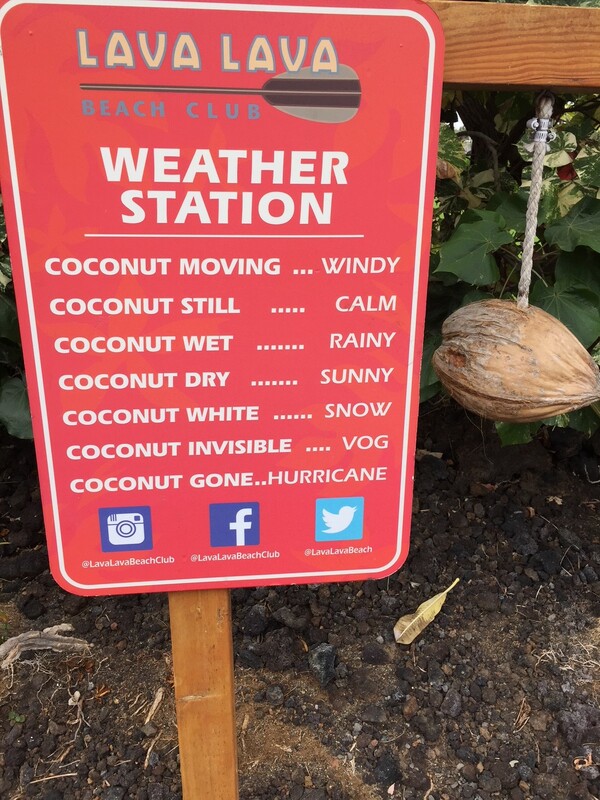 A much bigger question…SHOULD I CANCEL MY HAWAIIAN VACATION? The screaming answer is NO. Why? Because this eruption is only affecting a very specific small area on the Big Island. Note that even 90% of folks on that island wouldn’t be aware anything is happening (except for occasional small earthquakes). The typical low/mid level wind flow is from the northeast on this part of the globe; the famous “trade winds”. That means most of the “vog” (volcanic haze) and ash/smoke heads to the southwest and off the southern tip of the island. The vog does also move north to Kailua-Kona on the west side of the island in a typical windflow pattern. But this leaves the rest of the island chain unaffected by this current (or any future) eruption of Kilauea. Are our volcanoes affected? No, they form inland of the Cascadia Subduction Zone. Hawaiian volcanoes from in the middle of a tectonic plate that moves over a “hot spot” on the earth’s surface. Totally different setup and one is not related to the other. Today was sure refreshing wasn’t it? Clouds to late afternoon sunshine was far more reasonable for May. Do you realize we’ve only seen two days at/below average the entire first half of the month? Temps the first half of May have been more like a typical June! 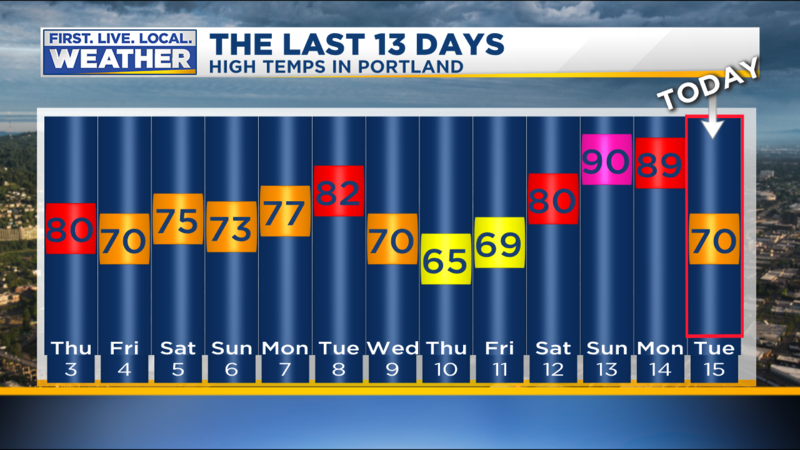 making this the 3rd warmest (actually tied for 2nd) May through the 15th. All those years were normal to above average (to hot) the summer following a very warm start to May. Interesting. What’s ahead? Generally warmer than average temps will continue, although a very thick marine layer (up to 5,000′ thick) Wednesday & Thursday means gray/cool both days. We might even see a shower or drizzle out of that marine layer. We could sure use some rain, but through at least the early part of next week I don’t see much. A good soaking would be nice before we get to Memorial Day Weekend. Regardless, I’m planting my garden very early this year for the reasons above. At my elevation I run about 8 degrees cooler than Portland and quite a bit wetter so typically it’s safer to wait until the end of May or early June. Not this year…I’m going for it! Note it wasn’t a record, most of those are into the 90s this time of year. As of today, this is the 4th warmest May “so far”…the first 13 days of the month. I suppose saying it’s the 4th warmest start to May makes a bit more sense. Tomorrow will be our 2nd hot day since we’ll have weak offshore flow in the morning (except in the south Willamette Valley) changing to an onshore surge of marine air by evening. In between we should end up somewhere between 87-90 once again. It’s also amazing how the “faucet” has shut off for almost a month now. 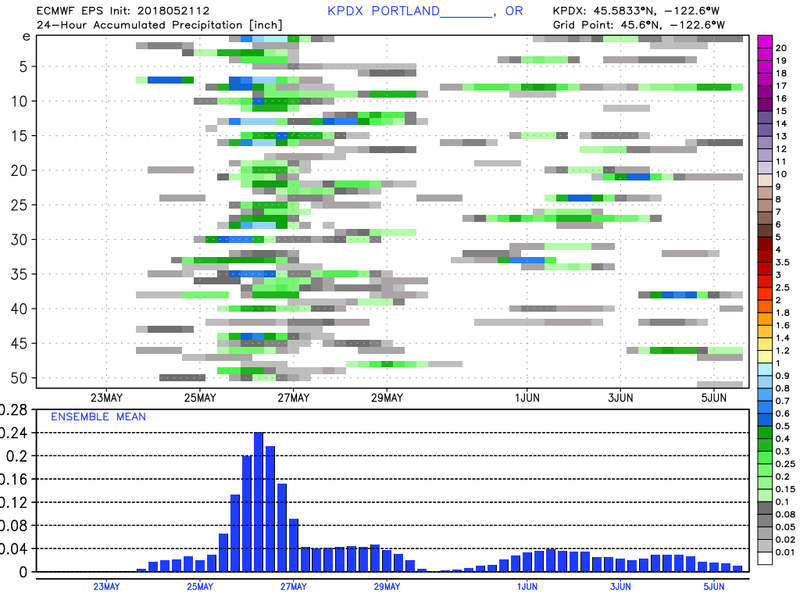 We’ve only seen 0.25″ in Portland in the past 4 weeks! The last real rainfall here was one month ago…around the 15th/16th of April. So it’s time to begin watering…much earlier than normal since I don’t see a typical cool/wet pattern setting up over us in the next 7-10 days. That said, the ECMWF implies we may see widespread showers at some point NEXT week. You see the green bars start adding up around the 21st or so. By the way, VOG (volcanic+fog) is the haze, not real fog, produced by Kilauea volcano on the Big Island of Hawaii and sometimes farther west into the other islands. It looks/feels similar to our forest fire smoke days, but there’s no smell. No, I didn’t see any real lava. I stayed on the west side of the island, a good 2-2.5 hours away from Madame Pele’s fireworks. I didn’t see any reason to drive that far just to sit at a roadblock and see steam in the distance. I missed the big quakes too, didn’t feel a thing. I have to say, it sure is nice to be home. An 80 degree day blue-sky day in May in the Pacific Northwest beats any tropical location! You are currently browsing the FOX 12 Weather Blog blog archives for May, 2018.